Charlottesville Victim's Mother Says She Will Not Take Trump's Calls : The Two-Way "You can't wash this one away by shaking my hand and saying I'm sorry," Susan Bro told Good Morning America. 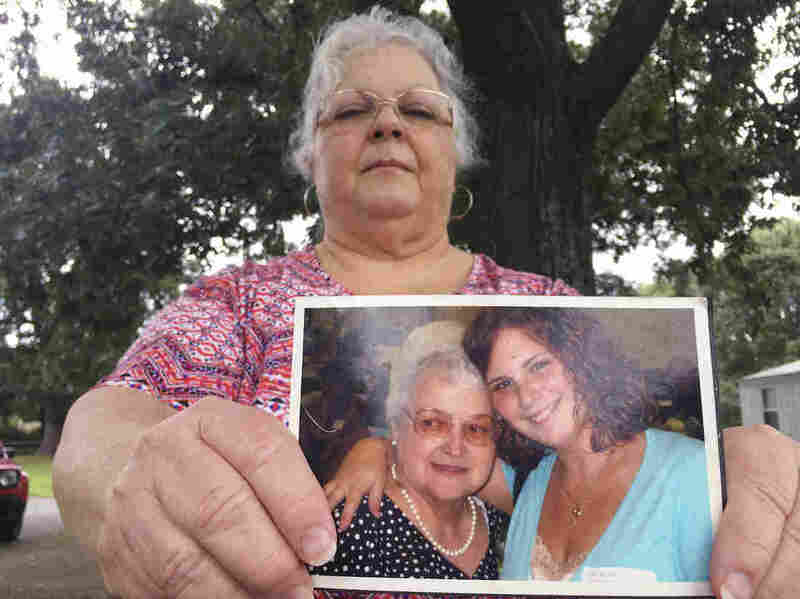 Her daughter Heather Heyer was killed as she was protesting against white supremacists. Susan Bro, the mother of Charlottesville victim Heather Heyer, holds a photo of Bro's mother and her daughter on Monday. Susan Bro, the mother of Charlottesville victim Heather Heyer, says she will not speak to President Trump because of his comments that suggested white supremacists and people protesting against them were both to blame for last weekend's violence in Virginia. "You can't wash this one away by shaking my hand and saying I'm sorry," Susan Bro said during an interview with ABC's Good Morning America. Later Friday, Charlottesville Mayor Mike Signer said he planned to propose memorializing Heyer in the city. Heyer, 32, was killed on Saturday when a car plowed into a group demonstrating against a white supremacist rally. Nineteen others were injured; the suspected driver, James Alex Fields Jr., participated in the far-right rally. He is facing charges including second-degree murder. Bro said she initially missed calls from the president, the first of which "looked like it actually came during the funeral" on Wednesday. That day, Trump tweeted, "Memorial service today for beautiful and incredible Heather Heyer, a truly special young woman. She will be long remembered by all!" Bro said that she received "three more frantic messages from press secretaries throughout the day and I didn't know why." She said she did not immediately respond because she was recovering from the funeral and focused on setting up her daughter's foundation. It wasn't until Thursday, Bro said, that she heard Trump's comments that appeared to equate the actions of the protesters and the white supremacist demonstrators. "I'm not talking to the president now. I'm sorry. After what he said about my child," Bro said during the interview. "I saw an actual clip of him at a press conference equating the protesters like Miss Heyer with the KKK and the white supremacists. ... I'm not forgiving for that." Trump initially stated that there was violence "on many sides," as NPR has reported. In comments Monday, Trump specifically called out "the KKK, neo-Nazis and white supremacists and other hate groups that are repugnant to everything we hold dear as Americans." "I'm not putting anybody on a moral plane. What I'm saying is this — you had a group on one side, and you had a group on the other, and they came at each other with clubs and it was vicious and it was horrible and it was a horrible thing to watch. ... But there is another side. There was a group on this side, you can call them the left, you've just called them the left, that came, violently attacking the other group. So you can say what you want, but that's the way it is." During Heyer's memorial service, her mother called on people to honor her daughter's legacy by fighting injustice. As NPR's Camila Domonoske reported, Bro cited a Facebook post that Heyer wrote: "If you're not outraged, you're not paying attention." In a statement, the mayor said he was seeking to magnify Heyer's voice, as her mother asked. Signer also said that he planned to "work with my colleagues on City Council to demand that our General Assembly swiftly enact legislation allowing localities to ban the open or concealed carry of weapons in public events deemed to pose a potential security risk." He said that however the city decides to memorialize Heyer, it should be "in a way that tells the truth of what happened in our city." Signer called for the removal of Confederate statues from downtown Charlottesville and asked that the governor and the state's General Assembly "come together in a special session so the legislature can swiftly act to enable localities to determine the fate of monuments like the Lee statue." A previous version of this story stated that President Trump cited violence "on many sides" on Tuesday. In fact, that language was in his initial statement after the attack. On Tuesday, he suggested there was "blame on both sides."